Antony, a Roman ruler, relishes life in Egypt with his lover Cleopatra, Egypt's queen, and ignores a summons from Rome. A soothsayer reads fortunes; Antony learns his wife has died and his power is threatened, so he decides to leave Egypt. Cleopatra, angered and saddened by Antony's decision to leave, rebukes him passionately but ultimately allows him to go. Octavius Caesar and Lepidus, the other two triumvirs, lament Antony's absence and make plans to confront Pompey. Cleopatra laments Antony's absence and writes to him constantly; she receives a message and a gift from him. Pompey learns Antony is returning to Rome and speculates on whether Antony and Caesar will join forces to oppose him. Caesar rebukes Antony but they reconcile when Antony agrees to marry Caesar's sister; Enobarbus describes Cleopatra. Antony says goodbye to his wife Octavia; warned by a soothsayer to stay away from Caesar, he decides to return to Egypt. Lepidus bids farewell to Maecenas and Agrippas as they all prepare to travel to Mount Misenum to find Pompey. Cleopatra, pining for Antony, is furious when she hears he is married. Caesar and Antony meet with Pompey, who accepts their peace treaty; Enobarbus predicts Antony will return to Cleopatra. Caesar, Antony, and Lepidus drink with Pompey on his ship; Menas encourages Pompey to assassinate them, but he refuses. Ventidius tells Silius he defeated the Parthians but he is wary of pursuing further victories lest Antony grow jealous. Caesar bids goodbye to a tearful Octavia and instructs Antony to take good care of her; Caesar and Antony part ways. Cleopatra asks the messenger about Antony's new wife and is satisfied that Octavia cannot compare with herself. Antony airs his grievances against Caesar, but Octavia begs him not to fight Caesar and departs to act as a peacemaker. Eros tells Enobarbus that Caesar has defeated Pompey and ordered Lepidus's execution, making him a greater threat. Caesar learns Antony gave his kingdom to Cleopatra; Octavia returns and he is furious at her mistreatment. Although he has the advantage on land, Antony obeys Cleopatra and decides to fight Caesar at sea, to his men's dismay. Caesar orders his lieutenant not send any troops to fight on land but only to engage at sea. Antony prepares to set up his troops in preparation for battle at sea with Caesar. Antony's dismayed soldiers discuss how Cleopatra fled the battle and drew Antony after her; they prepare to leave him. Antony, dejected by his dishonorable retreat, tells his followers to leave him, but reconciles with Cleopatra. After meeting with Antony's ambassador, Caesar decides to try and convince Cleopatra to kill Antony or hand him over. 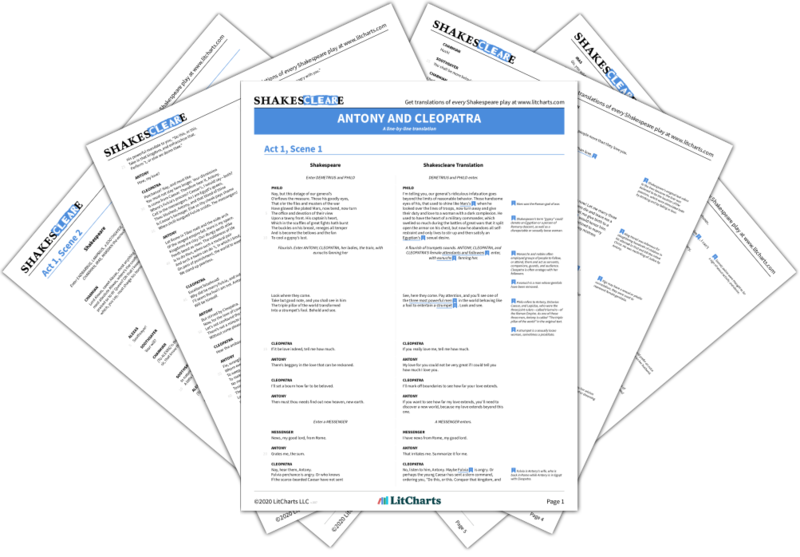 Cleopatra seems to accept Caesar's offer but pledges herself again to Antony; he is inspired to fight Caesar once more. Caesar decides to refuse Antony's challenge to single combat and to press his advantage with his armies instead. Antony bids a tender goodbye to his servants but also assures them that he expects victory in the battle with Caesar. Soldiers on watch hear strange music and speculate that it is the spirit of Hercules, Antony's protector, leaving him. Cleopatra helps Antony arm for battle and he departs to fight; he is optimistic about his chances, she is less so. Antony is devastated to learn that Enorbarbus has abandoned him, but sends him his treasure along with kind words. Enobarbus learns that Antony has sent him his treasure; Antony's generosity and his own treachery make him wish to die. Caesar's army retreats, to the exaltation of Antony and his troops. Antony celebrates the day's victory in battle, commending the brave Scarus to Cleopatra and ordering a feast and parade. Watchmen overhear Enorbarbus repenting aloud to the moon for deserting Antony; he dies of grief and they carry him off. Antony and Scarus discuss how Caesar is planning to attack by land and by sea, and set out to observe his movements. Caesar plans to attack Antony primarily by sea, since Antony has sent most of his troops to man his ships. Antony learns that Cleopatra's forces have surrendered & that she has betrayed him; furious, he plots her death and his. Cleopatra, seeing how furious Antony is with her, decides to lock herself in her tomb and tell him she's killed herself. Antony hears that Cleopatra has killed herself and decides to kill himself too; wounded, he learns she is still alive. Antony, wounded, is brought to Cleopatra; after final loving words, he dies and Cleopatra decides to kill herself too. Caesar mourns Antony's death; he sends a message to Cleopatra promising to treat her well, to prevent her suicide. Cleopatra is captured by Caesar's men; learning he plans to parade her as his captive, she kills herself with a serpent.